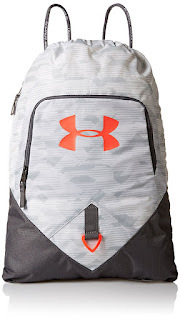 RUN over and checkout these Under Armour Undeniable Sackpack As Low As $18.74 (Retail $24.36). Click on Color for Prices. Side valuables pocket lined with soft tricot material . Easily adjustable single cording. Custom UA sternum clip. Front pockets for extra storage &amp; organization . D-Ring on front panel for additional attachment point. Dimensions: 19" x 15" x 2". Volume: 1500 Cubic In. / 25 L .